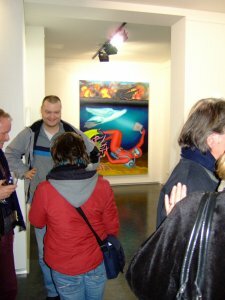 Planet Vivid Gallery opened in November 2006 and was founded by Helen Hofmann, the gallerist, and Ronnie Zimmermann, who is the resident artist. This gallery project is about creating something new and different with energy and passion. We chose a special and different name for the gallery, with the intention to create on the one hand a communication platform for modern contemporary art and on the other hand to indicate our concept of art, which is life-affirming, cosmopolitan, spontaneous, emotionally profound. 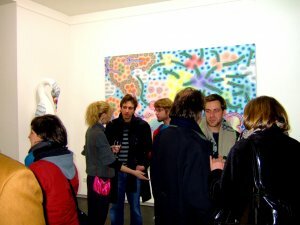 Exhibition opening Dirk Baumanns, "Baum=Mensch", January 16th 2009. Many times I am asked how I choose the artists and how I select the artwork. Most important is that the artists of Planet Vivid are dedicated to creating art. The artists we work with are vivid and energetic and devote their lives to creating art. We are interested in their well being and professional development. Like us, they have a strong passion for what they do. The artwork chosen is different, fresh, new and exciting. From an art-historical perspective Planet Vivid represents art that is influenced by various expressionist forms of art but also by Pop Art. The artists combine in their work emotional intensity and authentic self-expression. 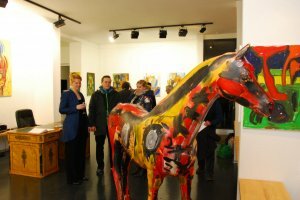 The selection of Pop Art in combination with abstract expressionism is not meant to be conflicting but should address scenery, situations and things out of our everyday life. Simple shapes, compositions and figures are combined with bright colors in large distinct surfaced areas, which gives the artwork a special emotional expressiveness. 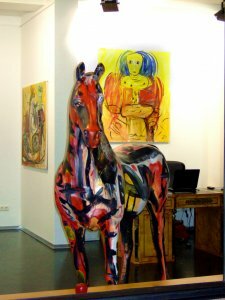 The pure abstract and also figurative expressionist work of the artists that we choose, consists of bright and bold colors, that affect the observer in a refreshing and electrifying way. The artwork we exhibit emanates intense energy. This affect is achieved mainly because they are created in a spontaneous way which in combination with intense colors creates a „busy“ feel, while observing the artwork. Nevertheless spontaneous energy paintings require a great deal of preparation up front especially when they are on a larger scale. Due to the colors, composition, spontaneity combined with simplistic shapes and a sophisticated sense of humor the artwork of Planet Vivid represents on the one hand playful images and create a feeling of joy. On the other hand our intention is to also show the tough and grown up part of life and not to only create an idealistic world based on child fantasy. Images around the struggle for life are created in a social and urban context. The figurative work may seem tragic and comic at the same time, whereas the comic side partially creates a sense of uneasiness.